in the Gold Cup final heat. 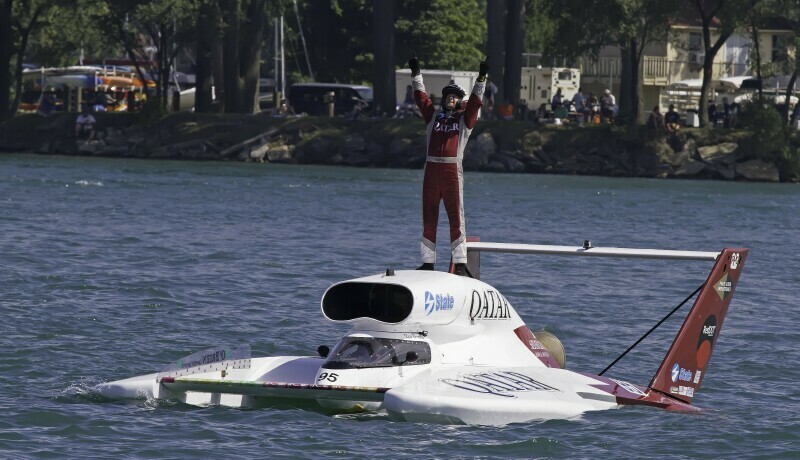 Steve David cannot catch a break in the Detroit APBA Gold Cup. After two disastrous Saturday heats where penalties cost the 59 year old driver of the 1 Oh Boy! 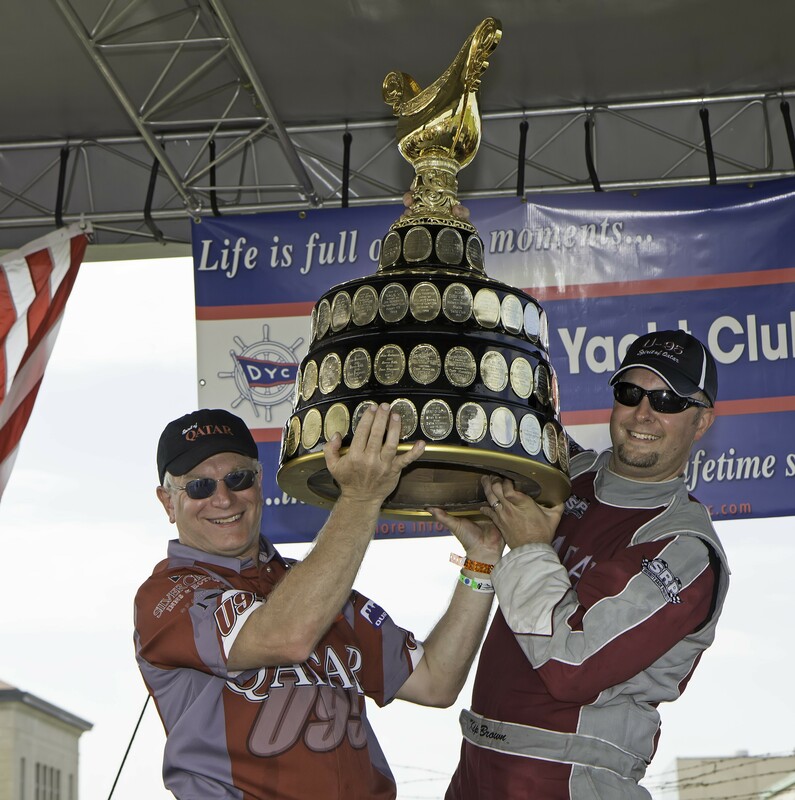 Oberto preliminary wins, things appeared to be going much better on Sunday. By the start of the Championship Final Heat, the veteran driver from Lighthouse Point, Florida had worked his way to the top of the weekend points ladder and was the favorite to win his first Gold Cup in 23 tries. He had finished second seven times. a victory in the 2013 Gold Cup. After ¾ of a lap, David had established a lead over Jimmy Shane in the 5 Graham Trucking, Kip Brown in the 95 Spirit of Qatar and Jon Zimmerman in the 9 Team RedDot. As the four boats came through turn two, David was called for a lane infraction and assessed a one lap penalty. Shane went into David’s roostertail and lost the front wing of his boat. With David penalized a lap and Shane’s craft crippled, Brown and Zimmerman were left to race for the Gold Cup and they staged a battle that had the Detroit crowd on their feet for four laps. Zimmerman moved out a lead over Brown and appeared to have superior boat speed, but Brown’s boat handled the rough water on the inside well and he used the shorter course to take the lead and the win from Zimmerman. There were nine lead changes in the final heat. Tom Thompson was third in the 11 Peters & May. Shane finished fourth and David Fifth. Mike Webster in the 22 Roostertail 55 did not finish. Brown, a 36 year old from Ravensdale, Washington, was the H1 Unlimited Rookie of the Year in 2008 but had never been a winner on the H1 circuit. His first win came in the biggest race of a career that started in 1995 in smaller classes. The 95 Spirit of Qatar is owned by Our Gang Racing of Preston, Washington, East of Seattle. The team is headed up by Brown’s uncle Nate Brown, a former Gold Cup winner and is carrying the Qatar sponsorship while last year’s winner, the 96 Spirit of Qatar, is undergoing repairs in Seattle. Next stop on the H1 Unlimited Tour will be the Lamb-Weston Columbia Cup in the Tri-Cities area of South-Central Washington, July 26-28.